Nymphoides geminata, the Entire Marshwort, belongs to the Menyanthaceae family and is an aquatic perennial. 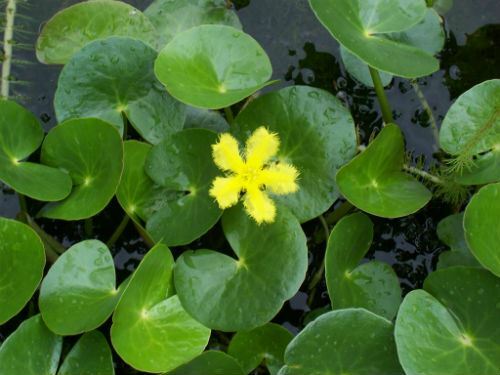 The Entire Marshwort has floating leaves that are almost circular, up to ten centimetres across, mid green glossy above and dull green and dotted below. In our ponds Leaf Green Tree Frogs sit on the leaves. The flowers are three centimetres across, bright yellow with fringed margins. The flowering period extends from September to April when the blooms are sometimes profuse but always conspicious. Flowers are held about five centimetres above the water. Both flowers and foliage are attractive features. N. geminata will live in water up to 2.5 metres deep. Plants grow in swamps to fast flowing freshwater streams. They will also survive is saturated mud. The Entire Marshwort is a widespread species and occurs in all eastern mainland states and South Australia. N. geminata would be a colourful addition to ornamental ponds. Plants could also be grown in water-filled containers on balconies and patios. Propagate from division of clumps.